Our new Mobile E-commerce Report unveils new data about transactional apps and how their users behave across different verticals. Despite the growing mobile app market, new data from our friends at Apsalar, Localytics and Adjust suggests that user attention spans are waning, with an 88% decrease in the average time spent on e-commerce apps from Q1 2015 to Q1 2016. People are now spending less than 60 seconds the apps. We see as much as a 35% decrease in average app session length quarter over quarter. Today we are releasing a report (Consumer Behavior on E-commerce Mobile Apps) that shows how app users behave when it comes to purchasing inside e-commerce and other transactional apps across different verticals, including: Taxi or ride sharing apps, food delivery, classifieds, travel and fashion e-commerce. The report highlights dramatic user behavior differences between these verticals. 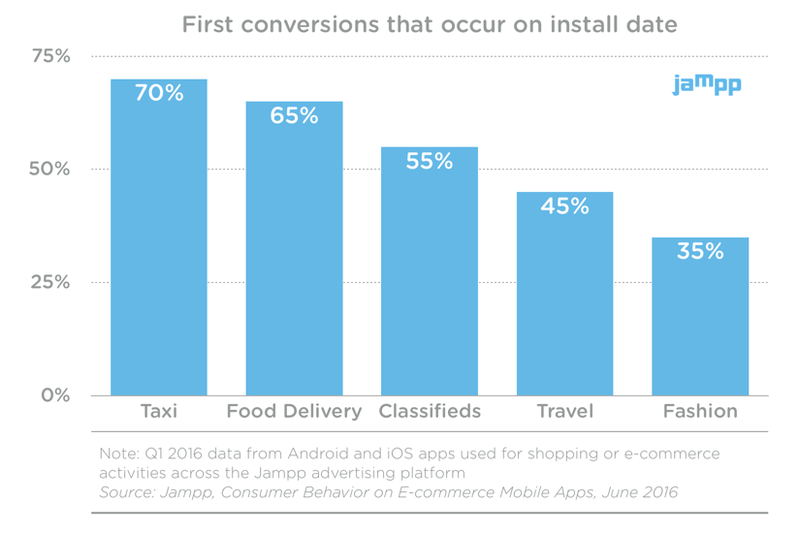 Taxi apps, for example, have the shortest latency period with 70% of first sales happening on the install date and 80% within the first four days. That means that if a user hasn’t converted within the first seven days, the chances of a purchase are practically nil. Whereas fashion e-commerce apps have a much longer window of opportunity with only 35% of first conversions happening on the first day of installing the app, and 70% within the first two weeks. • Fashion apps have the longest latency period: 31 days to drive 90% of conversions. 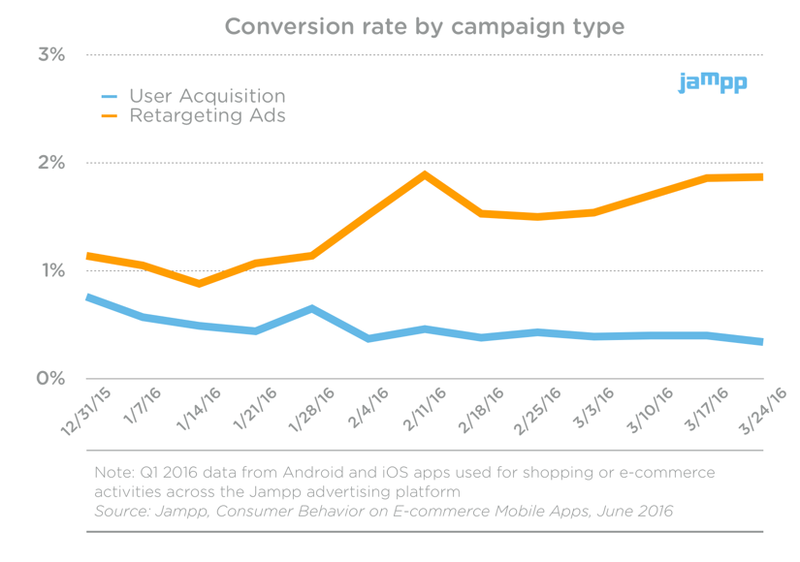 On a practical level, what the report tells us is that your chances of converting a user into a buyer are dramatically increased in those first few days after the app is installed. This is why trying to engage with those users during that time yields great results. The data tells us that retargeting ads are at least twice as productive compared to acquisition campaigns, in particular when showing highly relevant creatives. activities across the Jampp advertising platform. reflect the usage pattern of any single app on the Jampp platform.